I spent my Christmas Eve alone for the very first time, going back to Kuala Lumpur from Singapore, it’s also what I wanted coz’ I don’t want to celebrate or feel Christmas in any way, that is why I just want to isolate myself from everyone and just allow myself to be alone on this most important Holiday of the Year. My third day in KL is just rest time for me, just enjoying Berjaya Times Square’s Hotel, Swimming Pool, Huge Ten-Floored Mall and a Mini Theme Park. Berjaya Times Square is a one stop place for everything you need in a place. Buses to and from Singapore stops here too because it is right in the Central of Kuala Lumpur, the Capital of Malaysia. With regards to their Dishes, Malaysian Cuisine is similar to the Chinese and Indian Specialties, Spices are its main ingredient. There are a lot of pros and cons about Kuala Lumpur but if I would honestly describe it? Exactly the same as Manila Philippines but a little more improved compared to it. These two countries have the same flow of traffic and haggling modus of Taxi drivers on their passengers. Although, it is not polluted when it comes to vehicular smoke and garbage compared to Manila. 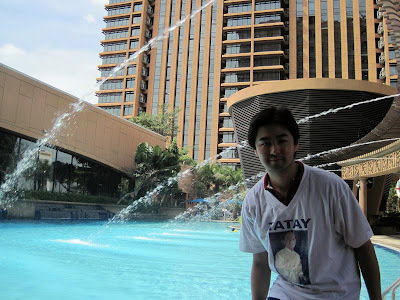 Overall, Your Pambansang Manlalakbay Armie “Happy Loner Traveller” Yuson enjoyed Malaysia’s KL Bird Park, Petronas Twin Towers and Berjaya Times Square Hotel… YEBAH!! !